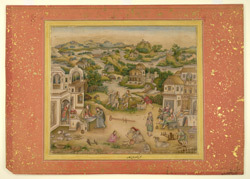 Gouache painting with gold of village life in Kashmir, by Mir Kalan Khan, working in the Lucknow/Faizabad style, c.1760. Inscribed on the border in Persian: 'majlis-i kashmir, 'amal-i mir kalan' (A Kashmiri assembly, the work of Mir Kalan). This painting depicts scenes of village life and in the centre a group of people are shown gathering grapes and wood while also cooking. On either side are several multi-storied buildings, and numerous waterways can be seen in the distance with buildings on the land in between. Mir Kalan Khan's distinctive Europeanised style was adopted by other Lucknow artists, yet this kind of scene and subject matter reamined unique to Khan. The source of his European influence is uncertain, but his extensive scenes often relate to Dutch and Flemish paintings. The facial type is distinctive, with frequent use of three-quarter face instead of profile. The artists place of origin is uncertain, but he may have been trained at the Delhi court, indicating that he came to Faizabad or Lucknow later in his life.